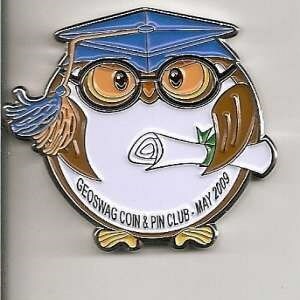 (TB2Z193) Geoswag C&P Club May 2009 - GeoGraduate Geocoin - Todie's Wild Ride II: Be Wise! Todie's Wild Ride II: Be Wise! Use TB2Z193 to reference this item. This coin wants to travel randomly and help spread the word: Always ride and drive responsibly, don't put yourself and others at risk! Gallery Images related to Todie's Wild Ride II: Be Wise! This is a message to let you know that your trackable item TB2Z193 has been marked ‘missing’ by a cache owner or a site administrator. Trackable items are marked missing when it is determined that they are no longer located in the cache they are listed in or in the hands of the current holder. Please review the most recent logs on your trackable item to learn more information about its current state. Not in this cache today but this is a busy TB Hotel and things tend to turn up. This guy has been in Washington for awhile. I will take him back to Vancouver with me and leave him in Oregon somewhere. I've caught a ride to Washington. See you at the next Cache.